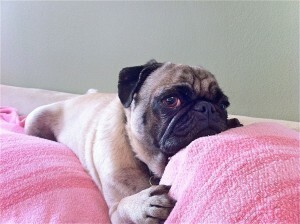 Margie is a 5 year old, spayed female pug that was an owner surrender. Margie is a total sweetheart and besides a mild ear infection she is in great health. She is a little over weight and I’m sure it’s contributing to her mild snoring issue. Margie went on her first walk with us today and she sat so nice and waited for us to say ok lets go and did really well on her walk. She doesn’t mind our pugs and was interested in our cat but we don’t know how interested yet as our cat was not interested in her and ran away. Margie is a very agile dog for being overweight. She jumped in and out of the bathtub like it wasn’t even there. She tends to skip stairs when she goes up them. It’s pretty stinkin cute. She doesn’t jump on the bed though which surprised me.